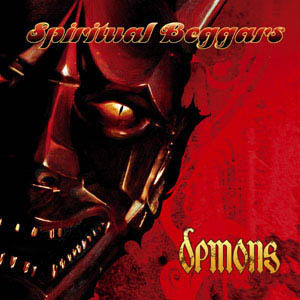 Demons is the 6th effort by Swedish quintet Spiritual Beggars. The band draws on influences that span across the rock spectrum to include elements of psychedelic rock, blues rock, hard rock and even heavy metal for the colossal song In My Blood. When meshed together these diverse influences form the basis of the semi-obscure stoner rock scene, of which the Spiritual Beggars are usually associated with. The lyrics are quite straightforward and focus on the struggles of life, regrets and depression but are presented in a way that is more akin to perseverance than misery. It is the last album by Spiritual Beggars to feature singer Janne “JB” Christoffersson (Grand Magus) whose powerful grit laden voice brings the songs on Demons to life in a way that few others ever could. His voice is backed by a plethora of catchy, driven guitar leads and passionate solos courtesy of founding member Michael Amott (Arch Enemy, Carcass). This contrasts with bassist Sharlee D’Angelo as his playing seems to exist somewhere in the middle of everything else and while never being washed out, he rarely comes to the forefront. He gives the album a denser sound quality but lacks many of the outstanding moments you’ll hear coming from the guitar. Spiritual Beggars frequently delve into fluid instrumental passages that give each band member the chance to really come to life and show that they have perfected their craft. Drummer Ludwig Witt injects creative fills between verses and keyboardist Per Wiberg provides colourful, sometimes textural keyboard lines (and an extended solo at the end of Dying Every Day). He often sounds like he is taking on a support role but if he featured more prominently it could have introduced an exciting and different dynamic to their sound. Spiritual Beggars embody the heart and soul of rock music on Demons and in doing so they create a genre defining album that should have a place in the collection of all rock fanatics.